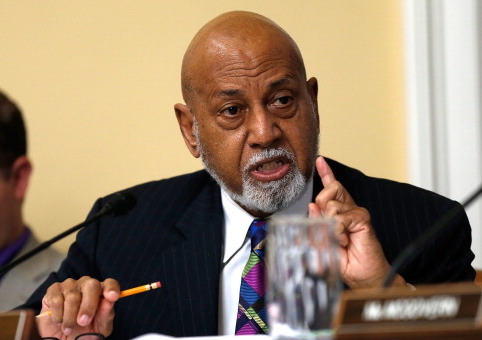 A convicted money launderer employed by Democratic Rep. Alcee Hastings (Fla.) in one of his Florida district offices received a pay increase for "part-time" work last year, new salary data filings show. Additionally, Hastings's longtime girlfriend Patricia Williams appears to have received a promotion, though she did not get a raise since she is already receiving the maximum salary that is allowed to be paid to congressional staffers. Dona Nichols Jones, who has been listed as working in Hastings's Palm Beach County Office for the past four years, was paid nearly $40,000 last year for "part-time" work. Nichols Jones was previously listed as an aide out of the office, but is now listed as a community liaison. When Nichols Jones first appeared on Hastings's payroll in 2014, she was paid $15,124.97. Nichols Jones was then given $20,499.96 in 2015. In 2016, her pay rose to $29,208.32. Last year, Nichols Jones received $38,666.66 from Hastings, according to new salary data posted by Legistorm. Nichols Jones has now been compensated $103,499.91 total for "part-time" work since first appearing on Hastings's payroll. Hastings's office did not return a request for comment on exactly what Nichols Jones's job entails or how many hours per week she works on average. Dona Nichols Jones and her husband Mikel Jones, who worked for Rep. Hastings from 1993 to 2011 as a district administrator, were both convicted of money laundering, conspiracy, and fraud in 2011 after using hundreds of thousands of dollars from a business loan for personal use. The FBI announced in 2011 that the Joneses schemed to defraud a lender after Mikel had taken out a business loan to help finance a Philadelphia law firm that he owned and operated. Jones had secured a multi-million dollar line of credit from Stillwater, a New York-based lender, and had agreed to only use the funds for legitimate purposes in relation to his firm. The Joneses instead set up a shell company and created fake invoices to steer money to themselves by falsely claiming that two companies—one of which they owned—were providing services to the firm that never occurred. The couple then used to the money to pay off credit card debt and purchase tickets to Philadelphia 76ers games. The Joneses also laundered $160,000 through Dona and her daughter's bank account to replenish money taken from Jones's law firm trust account. Over the course of a year—from 2008 to 2009—the Joneses obtained $350,000 using fraudulent invoices. Mikel Jones, who was convicted on 30 counts of fraud, was immediately fired from Hastings's office. Dona Nichols Jones was convicted on conspiracy, money laundering, and 14 counts of wire fraud and paid $400,000 in restitution and served one day in prison. Three years later, Hastings added Dona Nichols Jones to his district office's payroll. In other Hastings office news, Williams, the congressman's longtime girlfriend, is now listed as his district director in his Broward County, Fla. office. Williams was listed as deputy district director of the office last year. Williams served as co-counsel during Hastings's impeachment trial as a federal judge in the early 1980s after Hastings was charged with "conspiracy and obstruction of justice for soliciting a $150,000 bribe in return for reducing the sentences of two mob-connected felons convicted in Hastings' court." Hastings was acquitted in 1983 before a probe later discovered that he had tampered with evidence, conspired to accept bribes, and committed perjury. In 1989, the U.S. Senate removed Hastings from the bench, making him the first federal judge to be charged with a crime while sitting on the federal bench. Williams, who has worked in Hastings's Broward County office since 1993, has now received the maximum congressional salary that can be paid to staffers who are not in a leadership office—$168,411—for six straight years. Hastings also employs Williams's daughter out of the office. Following last year's Free Beacon report on Williams's earnings, the Foundation for Accountability and Civic Trust (FACT), a D.C.-based government watchdog group, filed a complaint with the Office of Congressional Ethics calling for an investigation into the payments. FACT also named Hastings a top ethics violator of 2017 for the maxed out payments to his girlfriend. Last year, Hastings was also reported to have used $220,000 in taxpayer funds to settle a sexual harassment lawsuit from a former staffer in his office.